Our random tests use Iometer to sprinkle random reads/writes across an 8GB space of the entire drive for 3 minutes, somewhat approximating the random workload a high end desktop/workstation would see. We present our default results at a queue depth of 3, as well as more stressful results at a queue depth of 32. The latter is necessary to really stress a four-way RAID 0 of SF-1200s, and also quite unrealistic for a desktop (more of a workstation/server workload at this point). We also use Iometer's standard pseudo random data for each request as well as fully random data to show the min and max performance for SandForce based drives. The type of performance you'll see really depends on the nature of the data you're writing. 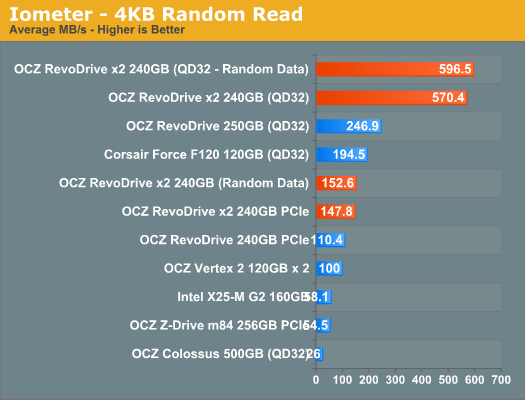 At best a single RevoDrive x2 (or four SF-1200 drives in RAID-0) can achieve over 500MB/s of 4KB random reads/writes. At worst? 286MB/s of random writes. Our standard sequential tests write 128KB blocks to the drive, with a queue depth of 1, for 60 seconds straight. As was the case above, we present default as well as results with a 32 deep I/O queue. Pseudo random as well as fully random data is used to give us an idea of min and max performance. 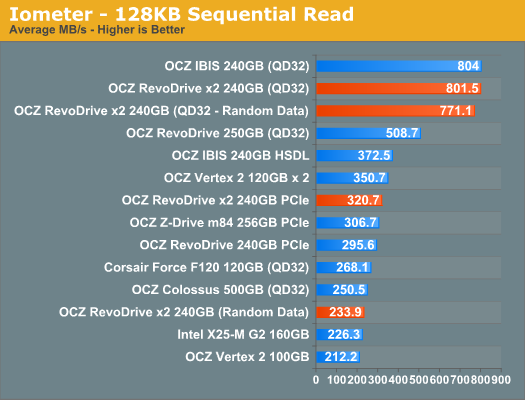 The RevoDrive x2, like the IBIS, can read at up to 800MB/s. Write speed is an impressive 677MB/s. 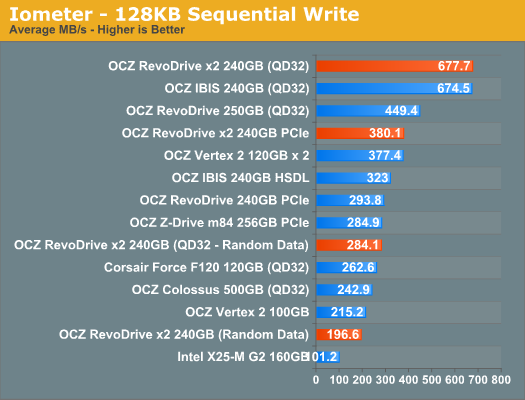 That's peak performance - worst case performance is down at 196MB/s for light workloads and 280MB/s for heavy ones. With SandForce so much of your performance is dependent on the type of data you're moving around. Highly compressible data won't find a better drive to live on, but data that's already in reduced form won't move around anywhere near as quickly. 800MB/s Sequential and almost 600MB/s random?! I now wonder where my piggy bank is? I think these Indilynx controllers might be faster than Sandforce for REAL workloads like COPY & PASTE under XP! I wish Anand would directly compare copy/paste speeds of both SATA and PCIe SSD's under XP as that IS the Number One Operating System for the forseeable future! XP is still number one .... for now. Windows 7 is selling very fast, and people are upgrading constantly. 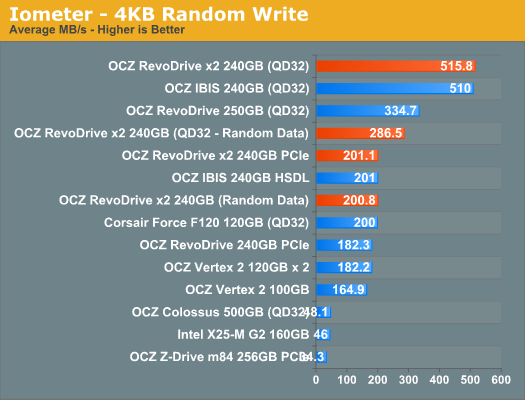 I don't see any real reason to doubt that 4x Vertex 2s would perform identically, especially with a discrete RAID card of reasonable quality, but has it actually been verified on the integrated RAID that comes with a "performance mainstream motherboard", both AMD and Intel? "ICH10 implements the 10Gbit/s bidirectional DMI interface to the "northbridge" device."